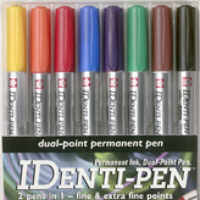 Double ended permanent marker pens. These are suitable for writing and colouring on most surfaces and are very good for colouring peel offs.The dual point multipurpose marker leaves a permanent mark on most non-porous surfaces. One end is for details, with an extra fine plastic point that won't break down. The opposite end is for broader lines, with a tough fiber point built for heavy use. The ink is resistant to water.